A CAD Dinosaur’s Journey, Part 10: There's An Array of Hope! As I continue my quest to conquer AutoCAD 2015 and become a thoroughly modern Dinosaur, onto the scene comes AutoCAD 2016. I must leave its study and review to more capable AutoCAD experts, of which there are many. As it is, my tiny arms are full at the moment and I’m having too much fun with AutoCAD 2015. A CAD Dinosaur’s Journey, Part 9: Hatching, Layers, and More, Oh My! It has been quite a while since I’ve done actual work in AutoCAD Release 14. In fact, since I jumped into 2015, I haven’t looked back. For this article I wanted to grab a few screen shots to compare and contrast the two versions. As I opened Release 14, it struck me how quickly it started, but that's about the only thing I miss. I can live with a longer startup because I’ll typically start AutoCAD and leave it open all day. Like plenty of other job sectors today, public works departments are being challenged to deliver a wider range of services faster and more efficiently with fewer available dollars and staff, says Pam Broviak, manager of Public Works Group, a portal for public works professionals. "This is why we are most interested in headlines and issues related to anything that offers potential to help us perform within these parameters," she adds. At some point, the AutoCAD programmers decided to add dynamic functionality to some AutoCAD features. Dynamic UCS, Dynamic Input, and Dynamic Blocks to name a few! When you typed in DYN at the command prompt, you'd see 13 system variables appear! You would think that the word dynamic would appeal to this dino and, to be honest, it does have a nice ring to it. As you know by now I’m a dinosaur. We T-Rexes like to eat meat and I’ve been anxious to sink my teeth into the REAL meat of AutoCAD 2015. I knew there would be plenty of meaty stuff in 2015. I was right, and it’s tasty too. 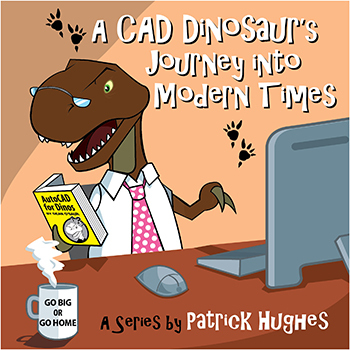 A CAD Dinosaur’s Journey, Part 6: Take Me to Your Mleader! In my last post I discussed Mleaders. I’ll make good use of them, but to my dismay I’ve run into a little stumbling block. Nothing insurmountable mind you, but forewarned is forearmed as they say. Perhaps my problems started when I first established my standards. Rather than load my drawings with custom styles, I simply modified the Standard styles. I set my standard dimensions to display dimension and extension lines to one color and dimension text to another color. These standards applied to leaders as well.